According to Sabrina Ramet "From June 1991 to December 1994 between 200.000 and 400.000 people had died as a result of the war between Serbs and non Serbs in Bosnia and Herzegovina" (Balkan Babel, 269). During the same period of time, at least 2.7 million people have been reduced to refugees. Arguably, one of the worst massacres in the late twentieth century took place from July 13th to July 18th 1995 in Srebrenica. Within these five days, approximately 8000 defenseless civilians were executed by the Serbian military. The vast majority of the survivors experienced extensive physical and mental abuse. Brutal torture, psychological hardship and the images of ruthless assaults onto unarmed civilians have forced survivors to live in constant fear and agony for the rest of their lives. WriteWork contributors. 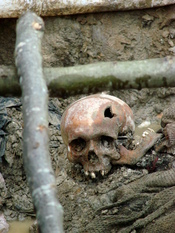 "Srebrenica - July 13 to July 18 1995, one of the worst massacres in the late twentieth century" WriteWork.com. WriteWork.com, 19 July, 2006. Web. 22 Apr. 2019.